Bespoke development is required when you need a feature that isn’t available from either your shopping channel (eBay/Amazon) or your own shopping cart/website. With any development you need to ensure you have a detailed specification of what it is you want to achieve. This way the software team can ensure you get the right price and service as well delivering the functionality on time. Just Applications have been developing software for over 9 years for both mobile and the eCommerce industry. Our development team is Microsoft certified. In order to give you an insight into the various projects we have completed. 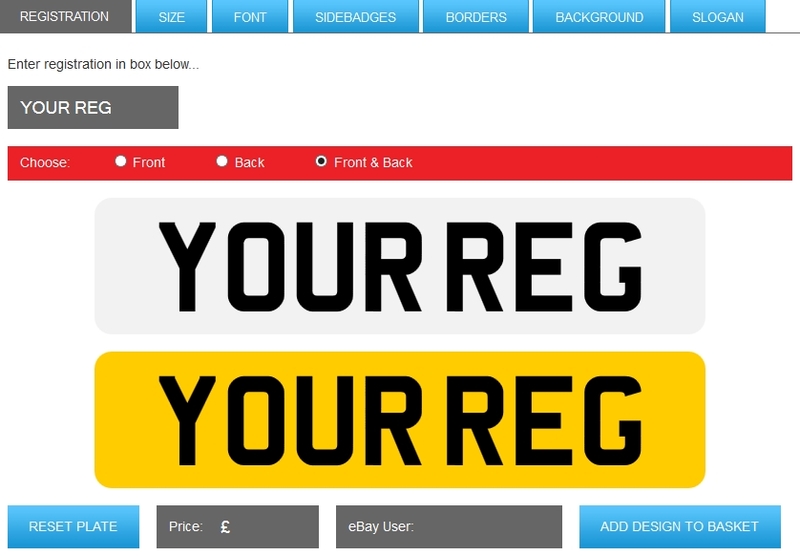 I have put together a case study from an eBay seller called Show Plates who tasked us to build a number plate builder for eBay customers to easily detail what number plate design they wanted and to help the buyer make the after sale process that much easier as the details would be put together in a graphical PDF In turn this would bring in more sales. Our initial contact with Wayne Godfrey from Show Plates took place in 2013 when we were discussing an eBay design package for his eBay store. After several conversations between him and one of our technical developers. A thorough specification was put together to identify what functionality the number plate wizard required. An e-commerce website has already been built and we were able to mimic the structure and cross-brand on to the eBay platform. We initially started with the branding package for the eBay shop, whereby we created the eBay shop design, including the categories layout and generating an eBay listing template for all his products. Alongside this the developer were busy working on the custom plate builder. The task was to clone the existing builder from Show Plates website and integrate it into his eBay listing template. Improving not only the design but the functionality and ease of selecting options. It was expected that we make the ebay design more attractive and more user-friendly. 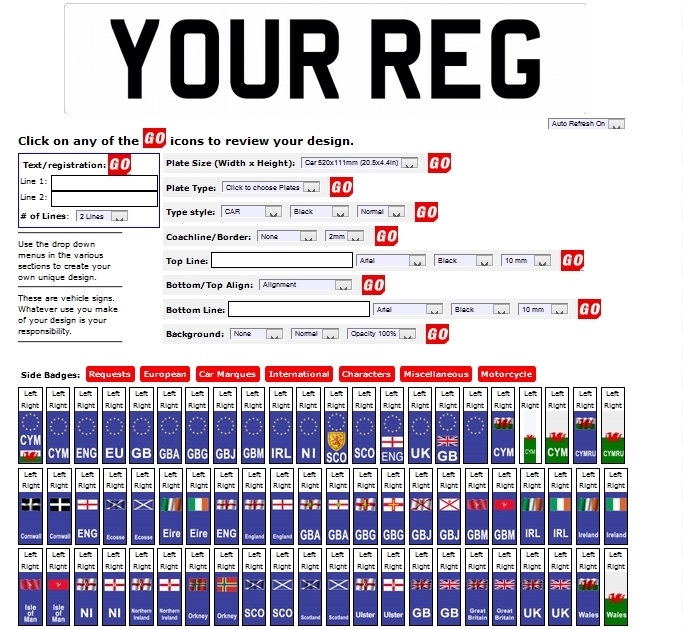 To get a better idea on the existing website plate builder see the image below. This image above illustrates how the builder is working on the Show Plates website. At the end of this article you will find two website links, one for the show plates website builder and one for the eBay Show Plates builder so you can see the improvements we have made to both the layout and usability. Initially we had hit a brick wall… However, with eBay’s help and the skills of our development team a workable solution was found that as long as the builder wasn’t taking the customer to another payment provider i.e. not eBay with no other marketing of any kind a web page hosted on our services would be acceptable. The brief once the customer had produced their chosen plate was to enter the eBay user id (mandatory) into the box provided where an entry gets created and a pdf generated so the seller can start printing and this is also available the customer to download. The customer continues to add their design to the basket provided and in-turn the payment is made through Pay Pal and the buyer is returned back to the eBay listing. Once the order arrives in Pay Pal the seller can check against the payments page in the builder to locate and print the correct customized plate. In order to see the work our Just Applications developers built please feel free to click on the two links below. You should see a difference in presentation, user friendliness as well the functionality from the eBay builder. The response of the eBay template builder is far quicker too because we have our own server farm that we maintain and look after. Plus some nice features have been added to get a real-time view of the plate itself, as well as it submitting to the seller any changes you make straight away. The design and layout of the screens have been put together in order that the build process from start to finish should take less than a minute. So thanks for reading my blog. This is just one example from several developments we have built over the years but I hope it gives you a flavour of just what we can do for you! If you require any further details on this topic or wish to see if your idea can be brought to live then please don’t hesitate to contact us: http://www.justapplications.co.uk/.